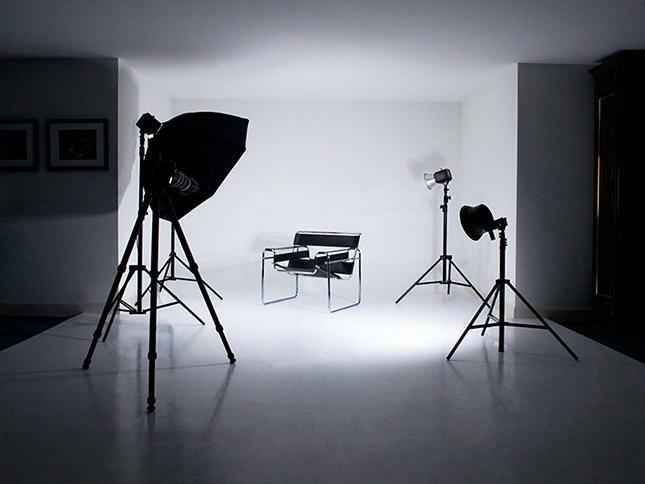 Whether you’re shooting for fun or aspire to open your own photography business, building your own in-home studio opens up a whole new world of photographic possibilities. From still-life product photos to refined studio-style portraits, an in-home photo studio can revolutionize the way you work. Here are a few things to consider when building your own home studio. When I think home studio, the first place I think of is the garage. Not only are garages good because they tend to offer a fairly open floor plan, they also tend to have a removable third wall that can also become a giant daylight source. I’m referring, of course, to the garage door. And if it happens to face north, you’re in great luck. A north-facing opening will fill the studio space with bright, diffused light that’s especially good for portraiture. An unused guest bedroom may not be as big as you like, but it may also be the most practical place to find unused space. Take advantage of natural window light in that scenario to minimize the clutter from lights and stands, and consider using slightly wider lenses for portraits—like a 50 or 60mm normal lens rather than an 85 or 100mm telephoto. Work with the restrictions of your room rather than trying to fight them. Whichever type of location you choose, you’ll ideally want a few things: unobstructed open space, high ceilings, hard floors and easy access to electricity. Hard floors, like wood or concrete, are ideal for stands. Tile would be better than carpet, but the grout lines may make setting some stands a pain. High ceilings mean you’ll have an easier time getting modified light sources (such as strobes with softboxes) above a standing subject’s eye level, and an easier time shooting and lighting from above. Ultimately, higher ceilings simply mean you’re less likely to be limited in your lighting and framing choices. Large open spaces do the same thing: allow you to put the subject and lights wherever you want without bending your agenda to match the space. Vertical supports in a basement, for instance, might limit where you can place lights in relation to a subject. A cluttered area means you’ll have a harder time every time you set up your lights. If you’ve got enough stuff in the way, you’ll find yourself moving the stuff before you can set the lights. Then if you want to move the light to a new position, you’ll have to move the stuff again. The open space requirement isn’t just about having a large room in which to work, it’s about keeping that room as clean and clutter free as possible. In an ideal world, your in-home studio would be used only as a studio. But the reality for most of us is that space is going to have to do double duty. Photographer Jeanne Reynolds recently built a home studio in her basement, pictured here. “The most difficult process for us,” she says, “was giving up our personal space. Your priority has to take precedence over your emotional investment in your home.” That means you’ve got to make sure your family is on board before you go converting the home theater into a personal photo studio. If you’re lucky enough to be building new construction, you can dedicate a space for your home studio from the start. Perhaps that’s a garage bay that won’t have a drop ceiling put in, a few extra outlets and 20-amp circuits (less likely to be tripped by high-output strobes or hot lights), or a big north-facing window. This would also afford the opportunity for dedicated storage. A walk-in closet-style room adjacent to the shooting space affords the opportunity to keep equipment storage separate from the working area—which means you’re able to avoid that killer clutter that makes small studios more challenging to work in. What’s the minimum space for your home studio? Well, that depends on exactly what you’ll be shooting. I’ll tell you that for portraits, I personally prefer a minimum area of 17 feet deep and 10 feet wide. I can actually be more flexible on the width, but what I really want (when I set up for portraits on location, for instance) is enough length to create distance between the background and the subject, and between the subject and the camera. This allows for lighting flexibility again. Sure, you can make portraits in smaller spaces, but if we’re talking ideals, this is mine. For tabletop photography, a much smaller space can work fine. And if you want to make your studio as versatile as possible, bigger is always better. What turns a big room into a photo studio is the equipment you put in it. This is typically lights, modifiers and stands. Here’s a list of the gear—aside from tripod, camera and lenses—that I’d want if I were starting a studio today. Lights – Whether strobes or hot lights, I’d consider three lights to be the minimum with which you can start. I know great photographers who use “chicken lights,” those $5 lights available at home centers that use regular old light bulbs, so I won’t limit you to the lights I would prefer. Whether you prefer hot lights or strobes, do consider the safety issues with each. Hot lights are hot, and when working in a home studio, you could be more likely to place those heat sources closer to flammable objects like drop ceilings, carpet and furniture. So while they’re less expensive, they do require a little more attention to use them at home safely. Strobes, on the other hand, don’t get quite so hot. They do like a lot of electricity, so if you’re not sure about the amperage of the circuits available in your studio space, as well as how many separate circuits you have, it may be worth the relatively minor investment to hire an electrician to dedicate a couple of 20-amp circuits to your studio space. Stands – Three lights means you need three stands. Standard eight- to 12-foot light stands will be fine, depending on the height of your ceiling, though you may also want to add a floor stand (in order to put a light at floor level) or a boom (to cantilever a light over a tabletop set or above a portrait subject as a hair light. If you have a drop ceiling, you can get a standard baby stud with a drop ceiling clip in order to easily mount a light at ceiling height. (Baby, by the way, is the size of the typical stud on top of a light stand.) I would also suggest at least one or two C-stands, which are immensely helpful for holding light modifiers such as scrims and flags. couple of flags to occupy those c-stands. The 2×3 dimension is a good all-around flag size, especially for small spaces. I find flags to be one of the most useful modifiers in my studio, whether I’m shooting people or products. And don’t forget the reflector. I have a white board on wheels (made out of a hollow-core interior door and a bit of lumber) that is a great fill light for portraits, and a handful of 2×3 foamcore reflectors in white and silver come in handy as reflectors for all sorts of things. Backgrounds – When space is limited, a floor-to-ceiling smooth, painted wall will eliminate the need for a seamless paper background in many instances. In a garage, or if you want to shoot full-length portraits, that seamless will be necessary. It’s also a great way to change backgrounds instantly without paint. The sacrifice, of course, is that you’ll eat up a few feet of floor space with the background. If space allows, a nine-foot seamless will be ideal. If not, consider the narrower 4.5-foot variety, which works well for head-and-shoulders portraits, as well as small products, and doesn’t eat up nearly as much space. Oh, and don’t forget the stands and crossbar to hold the seamless, or consider a wall mounting system (Manfrotto makes a few great options, including the one I use to hold three different backgrounds) in order to free up floor space. Miscellaneous – A stool is perfect for many portraits, and a tabletop is mandatory for tabletop photography (go figure). I use a door across two sawhorses as a sturdy table that’s easy to store out of the way when not in use. Extension cords (heavy duty 10- or 12-gauge, or better, ideally) are important if you want to be able to plug in multiple hot lights or monolights, or move your strobe pack around the room. Number 2 Pony clamps are immensely useful for all sorts of things, just like gaff tape (which is a studio staple). Black aluminum foil is also a great makeshift light modifier that is perfect for custom snoots or cookies (which create patterns in light). Sandbags are good for securing stands for a safer studio. One per stand is a good place to start. Insurance – If you’re setting up a studio in your home, it may be a good idea to speak with your insurance agent, not only about any added coverage for the gear and the space, but issues that may arise from inviting paying customers, or even volunteer subjects, onto your property. If you’re officially going into business, this would likely be addressed with your business policy, but it’s a good idea to consider it before problems arise, even for hobbyists with no intention of charging for their work. Whatever specialty you’re focusing on, you’re sure to have your own list of equipment must-haves. I’m just covering the basics for a generalist who may want to photograph a variety of things. Once you start working in your studio, you’ll quickly determine its limitations, as well as the gaps in your equipment and what might help you do your job better. The best thing, though, is that with the right space, making great photos gets easier. I’m looking at converting a space in my home to a portrait studio. These tips are a great start to plan the layout. Thank you.